Frank Lloyd Wright Newsletter - First Quarter 1981 V4#1 Heinz, Thomas A. Editor, 1) Pearson, Gay L. 4) Heinz, Thomas A. 4) Urbas, Andrea 1) "Wright-Designed House Newest State Historic Site. On August 5, 1981, the Illinois Department of Conservation acquired its newest state historic site, purchasing the Dana-Thomas House in Springfield..." 2) "Springfield�s Dana-Thomas House. 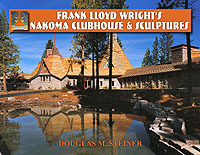 Buildings are too often the lease understood aspect of material culture, and this is especially the case where great architects are involved..." Includes 9 photographs. The Prairie House Journal (Premier and only issue published by Domino�s Pizza, Inc., Ann Arbor, Michigan) 1) Monaghan, Thomas S. 2) Hanks, David A.